“Go and create your own destiny.” That was the advice given to Emma Lipman last year and she has been following it ever since. Following that message, the former Manchester City and Sheffield FC defender’s career has now taken her to Italy where she is competing in Serie A alongside some of Italy’s and the world’s finest female footballers. “I realised I had come to a point in my life where I needed a new challenge,” says the 29-year-old. “I was happy with everything I had accomplished up until then but I felt at a standstill, especially in my football career. Having played for her local club Coventry City growing up, Lipman then attended Leeds Metropolitan University whilst playing for Leeds United’s women’s side, then known as Leeds Carnegie. At the time, the club competed in the second tier and during the defender’s six year spell with the club, they won the FA Women’s Premier League Cup and also the Women’s Premier League National Division. The defender then spent two years with Manchester City in the Women’s Super League where she won the WSL Cup before a spell with Sheffield would bring her time in England to an end for now. AGSM Verona would be the team to tempt Lipman away from the UK, a club competing in the women’s Serie A. After a difficult start, the former Leeds player soon felt at home on the continent. “Although for the weeks leading up to the move and probably my first month in Italy I felt as if I was being dragged through days with my eyes shut, I knew I was exactly where I was supposed to be” she says. The season previous to Lipman joining the club, Verona had finished third in Serie A, having won the title as recently as the 2014/15 season but for the English defender’s first season in Italy, there would be a new kid on the block. Juventus Women were founded ahead of the 2017/18 season and would build a squad instantly strong enough to compete for the title. The challenge of Juventus could wait though, as the defender adjusted to life on a foreign pitch. “There are some very clear differences between the two styles [of football played in England and Italy]. Most noticeable for me was the physical side of the game, after my first few games for Verona I think I must have conceded around 30 free kicks! Fifty fifty balls don’t really exist in the Italian game, that was something I had to adapt to pretty quickly. One thing which may not have helped Lipman on the field after all the fouls was not being able to plead her case to the referees as she attempted to get to grips with the language. “Trying to learn Italian has definitely been one of the most challenging things for me while being over here,” she says. “Last season we had a lot of Internationals so English was the common language. This season the majority of the players are Italian so it testing me more communicating on and off the pitch. Last year, the 29-year-old made 21 league appearances, missing just one match all season as Verona finished seventh in the 12 team league. Juventus romped to the league title in their debut season, losing just two games all season but in the summer, Lipman had a chance to join a new project of her own as another of the giants of the men’s game would enter the league. “As soon as I heard about the project at AS Roma and the vision the club had integrating a women’s team with the men and focusing on developing youth players, I knew it was something I wanted to be part of,” she says. Roma were able to enter Serie A straight from their formation after taking over another club’s licence. This meant Lipman and her new teammates would be able to challenge Juventus from the get go. The club recruited several internationals as they aimed to build a side strong enough to make “the Romanistas proud in our first season together” as Lipman puts it. AC Milan also entered the league this year and Juventus again recruited more big names. 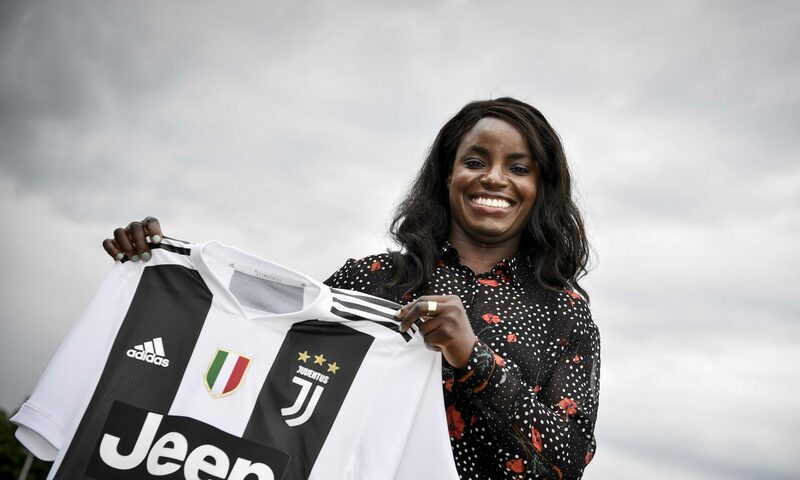 Two of those star signings were English internationals with both Eni Aluko and Lianne Sanderson signing up for the Turin club and the Roma defender recently got the chance to play against the pair. “It’s great to see more English players being attracted to Italy, especially the likes of Eni and Lianne. I know Eni from Birmingham and I remember playing against Lianne when we were both quite a few years younger! “It was a good early test for us and showed how much growing and learning we still have to do as a team [Juventus won 4-0 with the help of a hat trick from Aluko]. After six games so far this season, Roma are seventh with two wins and the English defender has yet to miss a single minute of action in a rapidly improving league. Despite having played in the Women’s Super League and having won several competitions back home, the former Manchester City defender has yet to receive international recognition for England but this could be to the advantage of one of their rivals. “I would never say never, of course that would still be the absolute dream [to be called up to England]. It’s great to see the positive changes that have taken place in the England set up and seeing young players get the opportunities they deserve. Right now though, Lipman is focussed on making Roma’s debut season a success and as she heads further into her second season abroad, she has become a true advocate of the English abroad club. “All I can do is speak from my experience and so far in my case I would 100% recommend it [a move abroad]. For sure the growth of the WSL over the last few years has been amazing for women’s football in England and the fact it is classed as one of the top leagues in Europe is credit to The FA. “For any young aspiring female player it has to be the ultimate goal I appreciate that but the life experience you can gain from playing abroad through adapting to a different culture, meeting new people, learning a new language and dealing with different challenges you may not face at home has the ability to grow you so much as a person. Playing against experienced internationals can only improve Lipman’s own hopes of a call-up but even if the opportunity never arises, the move abroad seems to have done wonders for the defender’s career on and off the pitch. I am very proud of you, dear Emma! Honored of receiving your trust and being in pole to be as supportive as possible with my advices for your career. On and off the pitch you are an inspiration and role model. Very proud of you Emma and I know you are living your dream but I do miss you .